You helped build the Maison Labyrinth. It is there because of your collective efforts. This weekend is dedicated to you as a builder and walker. This weekend is also dedicated to making the Maison labyrinth a Legacy Labyrinth. It will be #6 in the global linage of Legacy Labyrinths. 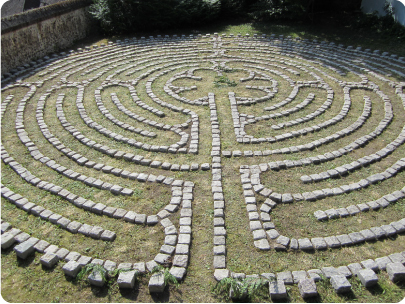 Chris Katzenmeyer, Project Director of the Legacy Labyrinth Project will facilitate our efforts and help us focus our intentions for Peace and Healing for the planet, through connecting the Maison labyrinth with all the others. The cost is $329 for 2 days, including lunch and coffee breaks. Unfortunately there is no housing available at the Maison for Friday and Saturday nights. We encourage you to find housing together elsewhere and have included a list of other options.